VMAT1 antibody LS-C18499 is an unconjugated rabbit polyclonal antibody to VMAT1 (SLC18A1) from mouse and rat. Validated for ELISA, IHC and WB. SLC18A1 / VMAT1 antibody was raised against a 12 amino acid C-terminal peptide sequence from rat VMAT1 (1). This peptide is predicted to be cytoplasmic. Detects a major band at ~55kD in postnuclear supernatants of CHO transfected with VMAT1 and not in wild type cells. Some additional bands, both higher and lower MW, were also detected and remain unaffected by the inclusion of protease inhibitors. Species Reactivity: Rat. Not expected to cross-react with human VMAT1. Western blot: 1-10 ug/ml (Chemiluminescence technique) Immunohistochemistry: 1-20 ug/ml on paraformaldehyde fixed sections. 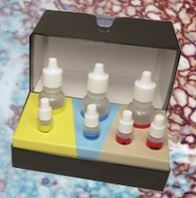 ELISA: 0.5-1.0 ug/ml (1 ug/ml VMAT1 peptide/well).